Powered by reasonably strong brand equity in the inverter and domestic power appliances market through the Luminous brand of products, Delhi-based SAR Silicon Systems Pvt. Limited, has drawn out elaborate plans for automotive and inverter battery segment. A job festival (JobFest) was organised here today. Sixty-two corporate houses from more than 19 service industries, including airlines, hotels, banking, tourism, telecom and IT-enabled services, guided youth about various opportunities that exist in the so-called ‘non-conventional’ fields. Services sector, which includes hospitality, event managements, call centres, transportation, travel and tour, etc, will be the biggest employment generators in India in the next few decades. China’s booming automobile industry is attracting global giants, including Tata Motors to venture into a market which is expected to overtake the United States by 2020 as the world’s biggest auto producer. The foreign institutional investors (FIIs) totally stayed away from the debt market while notching up heavy net purchases of Rs 1,035.6 crore ($ 229.3 million) in equities for the trading week ended April 9. Domestic information technology (IT) market is embarking on a high growth path and telecom, financial services and government are the drivers, according to a study. The news broadcaster New Delhi Television (NDTV) India Ltd’s initial public offering (IPO) will open for subscription on April 21 to raise about Rs 100 crore from the capital market. 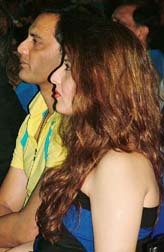 Former cricketer Mohammed Azharuddin and his wife Sangeeta Bijlani at the launch of Shades Fashion Event (eyewear) in Hyderabad on Saturday. Last week, trading remained lacklustre as cautiousness set in head of the announcement of the fourth quarter corporate results. The sensex gained 50.37 points at 5,838.45 and Nifty gained 12.45 points for the week to 1,853.55. Q: I have sold a plot of land for Rs 25,00,000 during the year ended March 31, 2004. The said plot was acquired by me in the year 1980 for Rs 2,00,000. I am told that to avoid capital gains there is an option of investing some amount in certain bonds. Please advise me in this regard? “We are shortly going to launch a full range of batteries for the automotive and inverter segment. In fact, the batteries should hit the market by the end of this month,” Managing Director of SAR Silicon Systems Rakesh Malhotra told The Tribune in an interview. To this effect, the company is setting up a separate assembly line production facility at Baddi, which will eventually have a capacity of one million units per month. The company has already entered into a technology transfer tie-up with the US-based $ 685 million giant, EaglePicher Inc, for manufacturing of automotive and valve regulated lead acid (VRLA) batteries. The range of batteries will be marketed under the co-brand Luminous EaglePicher. Mr Malhotra said the company was presently focussing primarily on the replacement market for automobile batteries. “We have not initiated any discussions with automobile manufacturers for entering into an OEM (original equipment manufacturer) agreement,” he said. The replacement market in the automotive market in India is estimated to be to the tune of 3.5 to four million units a year. “This does not include the truck market as it is mainly serviced by the unorganised market,” he said. “Price-wise we will be placing our products at the fair value of the existing branded players. Technologically, we expect to make batteries, which will outlast the current ones by about 35 per cent”, he said. EaglePicher Inc., founded in 1843 and headquartered in Phoenix, Arizona, USA, is diversified manufacturer of innovative and advanced technology and industrial products for space, defence, automobiles etc. Presently, the company has more than 30 plants in the USA, Canada, Mexico, the United Kingdom (UK) and Germany. Mr Malhotra said the company was expecting to clock a 60 per cent growth rate in its turnover in the coming fiscal year. “Our present group turnover is about Rs 120 crore,” he said. On its flagship Luminous inverters, Mr Malhotra said the company was planning to make a deeper penetration in the rural and semi-urban market. “The present size of the inverter market in India is about 1.5 million units a year and is growing at a compound annual growth rate (CAGR) of 12 to 14 per cent,” he said. He said potentially, the inverter market has the capacity to grow by more than five times its current size. “We are developing specialised products for the rural market. For any inverter and battery manufacturer, it is extremely unfriendly environment mainly because of the poor quality of power,” he said. Mr Malhotra said Luminous is going to introduce two more products for rural market. “The new products will, to a fair degree, meet the requirements of the rural consumer. It will carry a comprehensive warranty, including the battery for three years,” he said. Mr Malhotra said, the company was going through a “bit of a makeover exercise” and was looking at diversifying into other products as well. Major Gulshan Sharma (retd. ), executive director of the Institute of Tourism and Future Trends (ITFT) and one of the key organisers of JobFest, said there are 40 million graduate unemployed in the country and plain-and-staid sectors like engineering, medicine et al do not have many job avenues left. Addressing a press conference he said more than 2,000 students faced on-the-spot interviews and nearly 400 of them got jobs today. He said those who attended the interviews were broadly categorised into three groups — technical graduates, graduates under 28 years and those whose graduation results are awaited. While speaking at length on the recent trends in the job industry, he pointed out that 318 out of 350 students from North-East India, who enrolled with the institute last fiscal, had already found placements in the service sector. Major Sharma said that nearly 5.5 lakh unemployed youth are currently registered in Punjab employment exchanges while Haryana has 8 lakh of them. For Chandigarh, the figure stood at 60,000. Earlier, an award ceremony, which started two hours behind schedule, was presided over by the Punjab Minister of Tourism and Culture, Mr Ashwini Sekri. The minister gave away the prizes to those persons who had made outstanding contribution to the development of the service industry. Others who addressed the press conference included senior-level managers from the call centre, airlines, hotel and event-management sectors. Experts feel though the manufacturing sector has done fairly well in the last few years, it will be the service sector that would be the major creator of jobs in the country in the next few decades . The share of this sector in the country’s GDP is 54 per cent. In its report titled, “India Vision 2020,” the Planning Commission has mentioned that India faces the challenge of generating 200 million new employment opportunities over the next two decades out of which 120 million would be in the services sector alone. The northern region has tremendous potential in terms of jobs for the educated unemployed in the business processes outsourcing (BPO) sector, largely due to their accent, knowledge and communication skills,” says Mr Ashish Kumar, Senior HR Manager, Converges. Healthcare, education, media and entertainment, transportation including civil aviation, housing, construction and enterprises in the unorganised sector have also emerged as significant components of the overall services industry in the country, the survey says. One sector that will be one of the biggest employment generators in the next few years is the event management. The industry is expected to grow by over 50 per cent in the next two years, reaching the size of around Rs 11,00 crore by 2005-2006. “You do different things everyday: it involves constant brainwork,’” says a senior executive associated with the event management. Tata Group Chairman Ratan Tata, who was here recently scouting for business opportunities for his conglomerate in China was clearly impressed by the fast pace of development of the Chinese auto industry. While Tata remained tight-lipped on the Chinese partner for a possible auto venture, he said the company is looking at exporting, importing automobile components from China and joint development of automotive products. “We are talking to some Chinese companies,” he said. China’s auto sector is among those being watched closely by the government to prevent redundant investment which could lead to overcapacity. Official statistics show that automobile production in China increased 56 per cent in 2002 and 83.25 per cent in 2003. The number of automakers in the country rose from 20 in 2002 to 32 at the end of 2003. But Tata said the overcapacity fears did not bother him since his company is intent on exploiting two-way trade and investment opportunities. “We’re looking at both countries together, not investing in China for China,” he said. In the past decade, China’s auto production had grown by 15 per cent on average every year, 10 times faster than in western countries, Vice Chairman of China Machinery Industry Federation (CMIF), Zhang Xiaoyu said. Mutual funds (MFs) recorded net sales of Rs 401.86 crore in equities but netted inflows of Rs 491.63 crore in debt instruments during the period under review, according to the data with SEBI here. FIIs were net buyers to the tune of Rs 417.4 crore ($ 92.7 mn) in equities, the highest for the trading week, on April 6. They were also net purchasers at Rs 318.7 crore ($ 70.1 mn), Rs 131.2 crore ($ 29.1 mn) and Rs 168.3 crore ($ 37.4 mn) on April 5, seven and eight respectively. The foreign funds were completely away from the debt market for the four trading days in the week. According to initial estimates by industry body National Association of Software and Service Companies (Nasscom), Indian domestic industry grew 11 per cent in 2003-04 to $ 7.42 billion. In $-7.42 billion domestic industry, share of software and services was $ 3.37 billion in 2003-04, up from $ 2.78 billion in 2002-03. The year-on-year growth in this segment was 14.8 per cent. In 2002-03, IT and telecom industry accounted for 22 per cent of the market, followed by financial services at 21 per cent, manufacturing 15 per cent and government 14 per cent. “Going forward too, these segments are expected to witness escalated IT-related activity and IT deployment, creating significant business opportunity for both Indian and multinational companies operating in this sector,” Nasscom said. According to Nasscom, spending by financial services sector is expected to jump to Rs 9,800 crore in 2004-05. In 2002-03, IT spending by financial services sector grew 18 per cent year-on-year to Rs 6000 crore. In insurance sector, IT investments are expected to clock Compound Annual Growth Rate (CAGR) of 35 per cent between 2001-02 and 2004-05, Nasscom said quoting IDC data. “Deployment of hardware, software and connectivity infrastructure remains the focus of this sector, which has also implemented Customer Relationship Management (CRM) solutions,” Nasscom said. Domestic IT market, which has been neglected for long, is now attracting some of the biggest names in the industry. TCS, i-flex, Infosys, Wipro, HCL Technologies, NIIT Technologies, Polaris, Infrasoft, Zenith Infotech, Nucleus, PCS and many others are focussing on this segment intently. The government spending on IT in 2002 was $ 1 billion, according to Gartner. In 2002, government accounted for nine per cent of the total IT spend in India and is expected to grow to 15 per cent over the next five years. Nasscom estimates that in next five years governments in India will spend close to Rs 15,000 crore on computerisation of their operations. In 2003, the Central government proposed a total outlay of Rs 2,550 crore for the national plan of e-governance. While Rs 1,485 crore has been allocated for the centre, Rs 800 crore has been kept aside for financial institutions and Rs 265 for state governments. The news broadcaster New Delhi Television (NDTV) India Ltd’s initial public offering (IPO) will open for subscription on April 21 to raise about Rs 100 crore from the capital market. The company has received a nod from SEBI for its domestic IPO, which would remain open for subscription for a week, investment banking sources said here today. A strong economic data along with improvement in liquidity in the secondary markets after year-end and return of money locked in the public issues, triggered a sharp rebound on the bourses in the last few days. Cautiousness emerged in the market as the market expects the future guidance by IT companies in general could be muted. The US backslash against outsourcing and a recent sharp surge in the rupee could lead to the muted guidance by IT companies. This week is crucial for the market as companies like Hughes Software, Infosys, Hero Honda, Reliance Energy and HDFC Bank declare their fourth quarter results during the week. Some amount of volatility on the bourses cannot be ruled out as the results flow in. Further, as the election dates draw near, investors would be keenly watching the activities on the political front, which could be reflected on the stock markets. Thus, investors need to keep a watch on all these developments, as these would play an important role in determining the movement of the indices. On the technical charts the 5840-5860 range is a strong resistance for the index while 5780 is acting as a support level. In case the index breaks below 5780, the market is likely to slip further to 5700 or 5650. On the upside the sensex can touch 6410 in the medium term. Biotech Major Biocon made sparkling debut last week at Rs 484.35, a 54 per cent premium to its public issue price of Rs 315. The stock closed the week at Rs 581.20, 84 per cent premium to the IPO price of Rs 315. Biocon is India’s largest biotech company with a presence in bio-pharmaceuticals, enzymes, customs research and clinical research. Biocon along with its subsidiaries is a completely integrated unit with capabilities from cell culture to drug discovery. Thus it has potentially many revenue streams from plain but differentiated pharmaceutical products to biological using recombinant DNA technology to drug discovery and development space addressing the contract research outsourcing (CRO) segment. The company’s 55 per cent revenue comes from stains, which has a world market size of $21 billion. Biocon’s focus is on the US and EU markets and has its plants approved by the regulatory bodies. It has filed relevant dossiers and waiting for 2 of the 4 statins to come out of patent in 2006 and 2010 respectively. The stock is quoting at a discounting of 47 to its earnings as per its last Thursday’s closing. The stock, though has run up too fast and may see a correction, long-term investor can then buy the stock for gains. Couple of weeks back, software stocks had received severe investor drubbing seemingly on the back of the uncertainties raised with respect to the effect of a severe rise in the rupee against the dollar as for Indian software companies, US is one of the key markets and a strengthening rupee has a negative impact on their earnings. But last week there was buying in the sector on the back of Infosys and Wipro showing intentions of coming out with bonus issues. Infosys also announced setting up of new subsidiary in the US for catering to consulting business. Taking a cue from MphasiS (fourth quarter results have been lacklustre results declared last week, investor should wait for the results and look into the guidance provided by company before buying into any software stock. Ans: As per the provisions of Section 54EC of the Act, if the entire amount of capital gains is invested in the specified bonds, there is no liability towards capital gains tax. In your case the capital gains works out at Rs 15,74,000/- as per detail below. Accordingly, if you invest Rs15,74,000 within a period of six months from the date of transfer of the land in the specified bonds, you will not be liable to pay any capital gains tax. Q: My uncle is a non-resident aged 68 years. He earns income from house property and bank interest from his assets in India. I recently came to know that as per the provisions of the Indian Income Tax Act, there is a deduction available for senior citizens. Please elaborate on the same. Ans: As per the provisions of Section 88B of the Act, a rebate of Rs 20,000 from the amount of tax payable is available to a senior citizen at present. However, the said rebate is only available to an individual who is a resident of India. Accordingly, your uncle would not be entitled to the rebate. Q: I alongwith my three brothers am the owner of a house property. The said property is being leased out to a company for their use as a guesthouse. We requested the company to give four separate rent cheques so as to avoid the deduction of tax at source. However, the company is of the view that even if it gives four different cheques for the monthly rent, it would still have to deduct tax at source. Please let me know whether the stand of the company is correct or not? Ans: It is presumed that the property in question is one property, which is in four names and is not divided by metes and bounds between the four brothers. Accordingly, based on various judicial pronouncements, the stand taken by the company is absolutely correct. Q: My client is working as an employee in an organisation located at Patiala although he is a resident of Rajpura. Due to his employment, he has taken a rented house in Patiala at a monthly rent of Rs 1500 p.m. and is living there. He had taken a loan for the construction of his house located in Rajpura some years back. During the financial year 2003-04, he has paid instalments of this housing loan including interest as due. I want to know that can he avail deduction u/s 24(b) in respect of interest payable after taking the net annual value of the house located in Rajpura as nil as prescribed u/s 23(2)(b) (as the house in Rajpura can not be actually occupied by him due to his employment at Patiala) simultaneously alongwith deduction u/s 80GG (in respect of rent paid for the house in Patiala.) The house in Rajpura is occupied by his family and, therefore, it has neither been let out through out the financial year 2003-04 nor any other benefit has been derived. Ans: The deduction under section 80GG is allowable if a declaration under Rule 11B of Income Tax Rules 1962 is filed. The declaration is required to be filed in Form 10BA which requires the claimant to certify that he is not occupying any other property the annual value of which is determined under section 23(2)(b) of the Act. In view of such a requirement under the Rules your client would not be allowed the deduction under section 80GG of the Act.